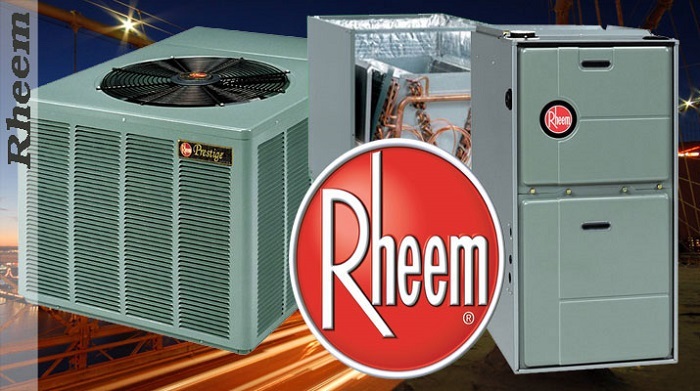 Rheem is a global producer of HVAC equipment with a history of innovation. Your Rheem furnace options range from inexpensive 80% efficient, single-stage furnaces to the Rheem Prestige R97V 97% furnace with modulating heat and a variable-speed blower. This Rheem furnace review will assist you in making an informed decision about this brand and its products. Rheem furnace pros and cons are included along with top models at each performance level. You might also be interested in our Trane furnace review that allows you to compare these two leading brands head to head. In 1930, brothers Richard and Donald Rheem, with financial backing from third brother William, incorporated the Rheem Manufacturing Company. The company originally made steel tanks but soon began producing water heaters and boilers. It wasn’t until 1947 that Rheem got into the residential heating and cooling business by acquiring the Frazier HVAC company. In 1960, Rheem acquired competitor Ruud Manufacturing. Today, Rheem manufactures a wide range of mechanical equipment for residential and commercial use. ​Single-stage gas valves always open to 100%, and this creates temperature swings as the furnace heats passed the thermostat set point. Two-stage gas valves open to 65% of capacity to maintain even, quieter heating, and open fully when a boost in heat is needed. Modulating gas valves, called variable-capacity valves by other brands, vary from about 40% capacity to 100% capacity, modulating like cruise control to deliver precise, even heat. Single-speed blowers run at full capacity all the time, so they are loud and push unheated air into your home at the beginning and end of the cycle. Multi-speed blowers start on a low speed and get faster and slower in stages as the combustion box heats up and cools down. Variable-speed blowers match run speed to the performance of the gas valve, so speed up and slow down incrementally during the cycle. ECM motors use less electricity than PSC motors and are employed in better Rheem furnace models. Rheem makes 80% single-stage and two-stage models and 90% to 97% furnaces with two-stage and modulating heat. ​Rheem innovation puts its top furnaces at the head of the class for efficiency and quiet operation. The furnace lineup offers models for every climate and budget including low-cost 80% to 92% Rheem Classic models, moderately priced Classic Plus models up to 95% efficient and Prestige Series furnaces up to 97% efficient. Rheem Classic Plus and Prestige Series furnaces will last for 20+ years when properly maintained. A Rheem furnace can be repaired by any experienced HVAC technician, not just Rheem specialists. Upflow, downflow and horizontal flow models are available to fit any installation requirement. Rheem furnaces are made in a range of BTU capacities to serve spaces up to 2,500 square feet. The most efficient Rheem furnace models qualify for rebates from many energy companies which can be searched here. Oil furnaces from Rheem are available if preferred to a gas furnace. Rheem also makes heat pumps, central air conditioners, thermostats and air quality ventilators, so any home can be equipped with a split system designed to work together for superior efficiency and climate control. The EcoNet coordinating technology improves the efficiency and performance when Prestige Series components work together. The Direct Spark ignition system has an excellent track record of reliability and durability. Built-in diagnostics provide quick discovery and repair of furnace problems. Rheem’s innovative PlusOne sensor signals a clogged furnace drain, so leaks and water damage can be avoided. Rheem furnaces are competitively priced when compared with similar furnaces from Trane, Carrier and Lennox. ​While an 80% furnace can be a good choice in warm climates when ecofriendliness isn’t a top priority, installing one in a cold-climate home will lead to costly heating bills because 20% of the heat is lost in the vented combustion gases. While Rheem Series gas furnaces are cheaper than Rheem’s top models, and they also lack the quality of the Prestige Series, make more noise and won’t last as long nor deliver the same high level of indoor climate control. Better warranties are offered by several competing brands including Heil, Goodman, Amana, Westinghouse, Tappan and Maytag (but not by Trane or Carrier). First, how efficient should your furnace be? In warm and moderate climates, an 80% efficient furnace is a cost-effective choice. A 90%-plus furnace would be greener, but it might take 10 years or more to recoup the extra expense of an efficient furnace through lower energy bills. In colder climates, a high-efficiency furnace is a better choice. Paying $500-$1,500 more up front and reducing your heating costs by 15-18 percent will create a short payback period. Secondly, is better performance worth paying for? It will be if you prefer balanced temperatures, less noise and reduced humidity in summer with staged heating and a variable-speed blower. 90% and higher modulating: 97% Rheem Prestige R97V. The bottom line is that Rheem is a dependable brand with good, better and best furnaces competitively priced in their classes. There are options to fit your preferences for efficiency and indoor comfort control. If this Rheem furnace guide has been helpful to you, please share it on social media for your followers and friends who might also be considering Rheem or identical sister-brand Ruud.